Today is St. Augustine’s day and I thought I would post here a sonnet inspired by Augustine’s beautiful commentary on the psalms. I wrote this sonnet in response not only to Augustine but also to Jeremy Begbie’s use of the Augustine passage in his excellent new book Redeeming Transcendence, and the poem was first published in that book this year. Here is the passage from Jeremy’s book, which includes the Augustine quotation, followed by my sonnet! A remarkable passage from Augustine is worth mentioning here. In meditating on Psalm 32:8, he writes: “Sing in jubilation: singing well to God means, in fact, just this: singing in jubilation.” And what does that mean? The experience is well known in charismatic and Pentecostal worship. Ecstatic song bursts the bounds of verbal language. Augustine reminds us of the limits of speech, in the face of both the need for a particular affective articulation of the heart and the need to recognize that God exceeds all speech. The sung jubiluscan “say” the unsayable, affording a “boundless expanse of rapture”. And yet there is no suggestion that we are thereby to take flight from any obligation to scriptural words, or are absolved from the need for clear speech to, or about God – even a few minutes with this theologian’s major texts would make that clear. On the contrary, Augustine’s “boundless expanse of rapture” stems from attending to the God whom he believes has graciously employed frail human language in his saving purposes. Augustine, St Augustine on the Psalms, trans. Scholastica Hebgin and Felicitas Corrigan, vol. II (Westminster, MD: Newman Press, 1961), 111–2. And here is my sonnet, you can hear me read it by clicking on the title or the ‘play’ button. 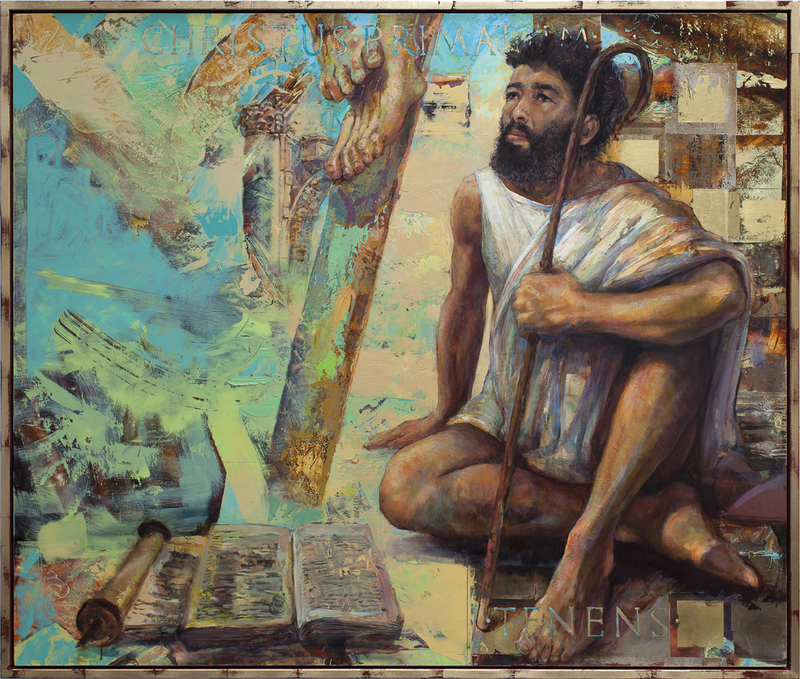 I am grateful to Bruce Herman for permission to use his striking painting of Augustine. Within and through the song, into the Son. Of scripture and his psalter breathes again. Might bear rich fruit for us in time to come. We reap with joy and bring the harvest home. 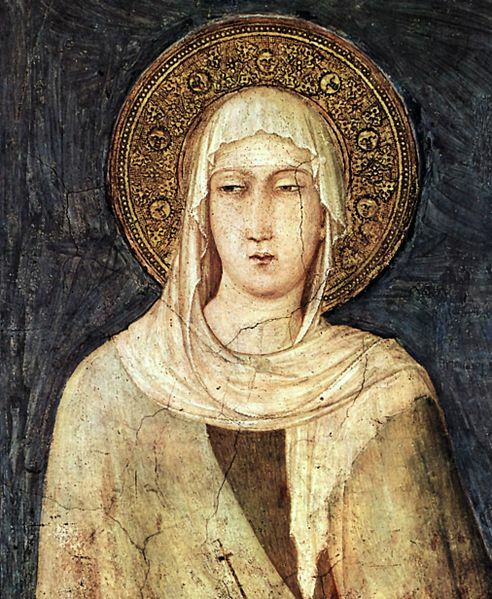 August the 11th is the day the church remembers with thanksgiving the life and witness of St. Clare. She was the friend and companion of Francis, and founder of the Poor Clares. Her love for Christ, her share in the vision of St. Francis and her extraordinary gifts a soul-guide, friend, and leader made her a shining light and a clear mirror of Christ for thousands in her lifetime and still a light and inspiration to Christians from many denominations today. Place your mind before the mirror of eternity! Place your soul in the brilliance of glory! Place your heart in the figure of the divine substance! of the Godhead Itself through contemplation. So here is my sonnet in her honour reflecting on how the meaning of her name, ‘light and clarity’, was also the meaning of her life. 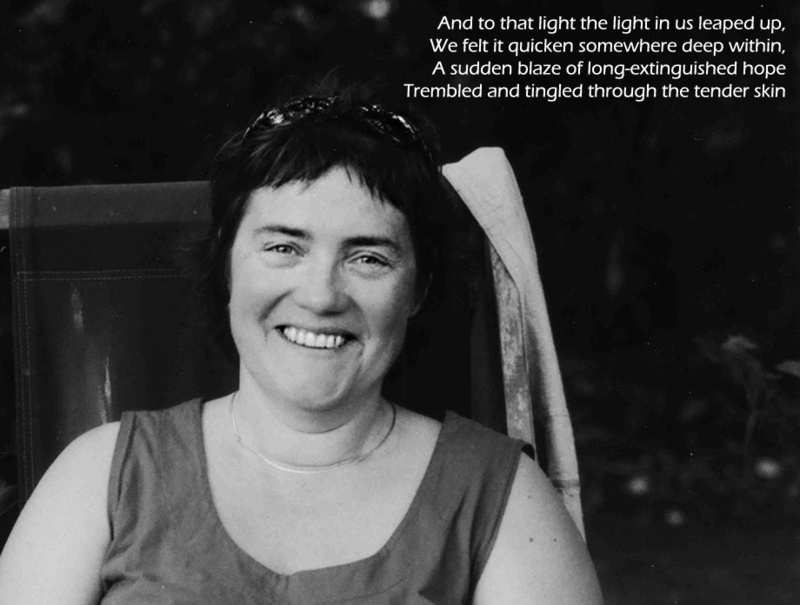 This sonnet is taken from The Singing Bowl , which is published by Canterbury Press and available through Amazon etc. Back into truth, simplicity and grace. Reveals in both of you your saviour’s face. A window into his eternal love. Pray for this pilgrim soul in his dark night. Continuing my series of sonnets ‘Sounding the Seasons’ of the Church’s year, here is a sonnet for the feast of the Transfiguration. This is the day when we remember how the Disciples, even before they went to Jerusalem to face his trials with him, had a glimpse of Christ in his true glory. The Transfiguration is usually celebrated on August 6th, but sometimes on the Sunday nearest. 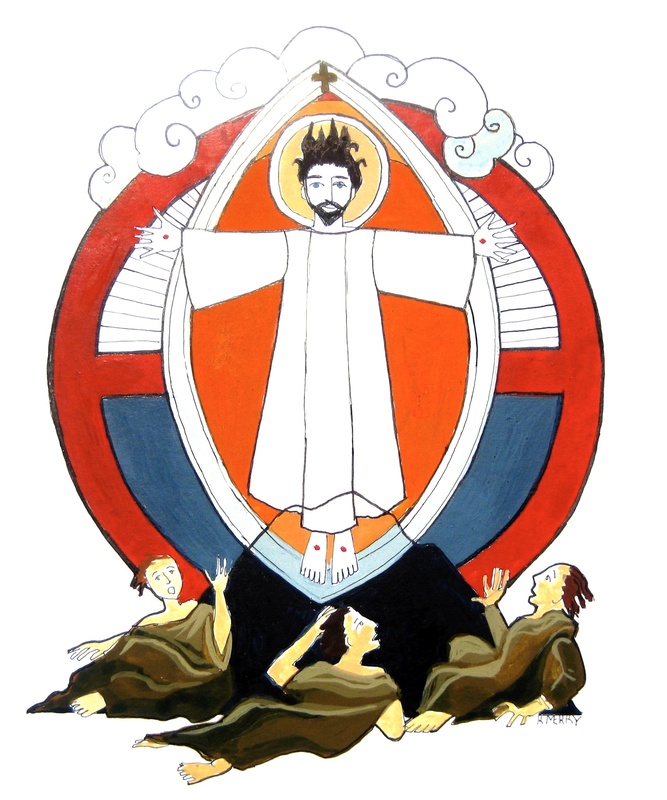 The transfiguration is also sometimes remembered just before Lent, which is a good time for it too, as I believe the glimpse of glory in Christ they saw on the mount of the Transfiguration was given in order to sustain the disciples through darkness of Good Friday. Indeed it is for a disciple, looking back at the transfiguration from Good Friday, that I have voiced the poem. I wanted to stay with the idea of the circle for an important event in the life of Christ, and the theme of cycle and circle that is a theme of your book – the changing of the seasons, the unchanging nature of God. Underneath is the circle and the cross, a symbol also in Egyptian hieroglyphs of the city but of course the cross (or crucifix) is the meeting point of two worlds, heaven and earth, and the division of the upper circle as light and the lower as dark also symbolises this. The red is a recurrent themes of all the illustrations but here it implies Christ’s blood (and sacrifice) but also the life blood and life giver that God/Christ is to us all, giving light to the world. As a person and as a photographer I so wish I could catch “the Love that dances at the heart of things”, and to have seen it not its reflection but the very Love in a human face…Imagine. Well it was immediately clear I could not count on my work. But then, the light in us that leaps to that light, that trembles and tingles through the tender skin, I believe I witness that. I am not sure what brought this smile on my friend’s face but I believe it had to do with her being seen, valued, loved. A camera is a light-box, and if I concentrate on them some people feel that it is their light and the light which I try to crystallise and they let them shine together. I am very grateful to both of them. As always please feel free to copy or use the poem in prayer or liturgy; you can hear me read the poem by pressing the ‘play’ button or clicking on its title. This sonnet is drawn from my collection Sounding the Seasons, published by Canterbury Press here in England. The book is now back in stock on both Amazon UK and USA The book is now also out on Kindle. Please feel free to make use of these sonnets in church services and to copy and share them. If you can mention the book from which they are taken that would be great.